Manipulate Data in the Cloud: Figure 2: Return the Atom Representation of Single Entities by Adding an ID to the Query. The Entity Data Model identifies entity instances by a unique ID value, which usually is the primary key of the underlying table. To return a single entity instance as an Atom <entry> document, add its ID in parentheses to the collection. 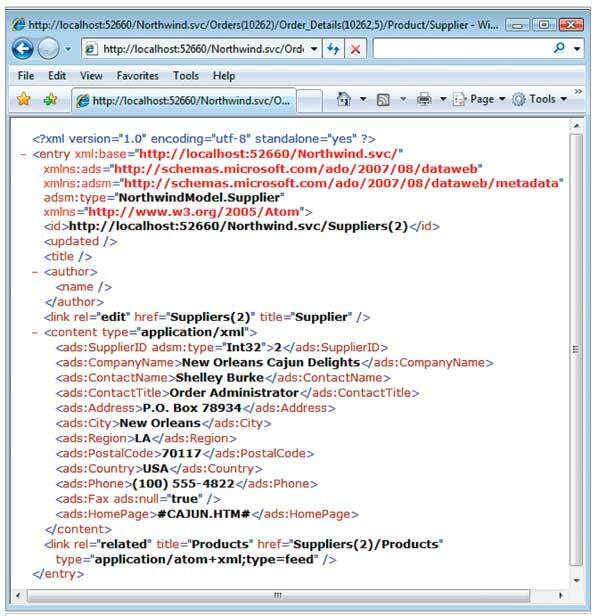 The http://localhost:52660/northwind.svc/Suppliers(2) URL displays the Atom representation of the New Orleans Cajun Delights entity. URI Queries and Atom/AtomPub formats will become the standard query and response formats for Windows Live Services; SSDS is expected to support these formats by the time it's released for general use.